On June 21st, the Planning Commission welcomed the inaugural class to our Future Leaders in Planning (FLiP) student leadership development program. 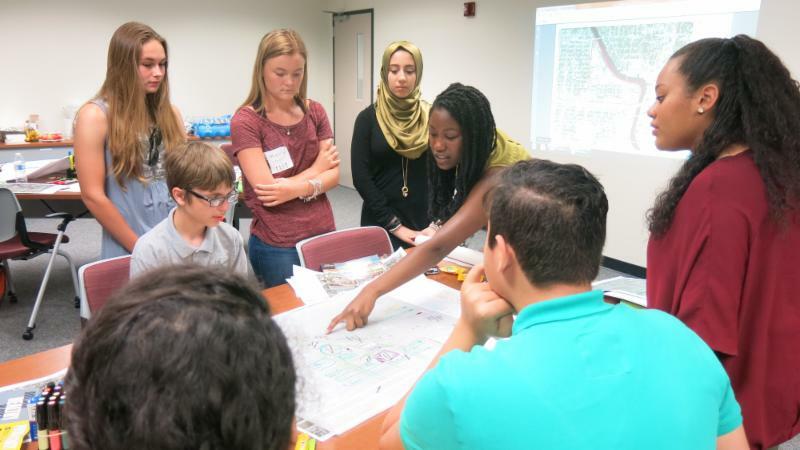 Designed as an opportunity to introduce high school students to urban planning as a potential career, FLiP 2016 gave these students the chance to network with planning professionals and other students with a passion for planning for a thriving future for our community. The two-day intensive program was a big hit with the students. They made the most of the opportunities to learn from public and private sector professionals in the planning and related government services fields, giving them broad exposure to planning from multiple perspectives, including: comprehensive planning, economic development, environmental, historic preservation, community redevelopment, transportation, geographic information systems, education and research, and more. FLiP is a partnership between the Planning Commission and Hillsborough County Public Schools in cooperation with ULI Tampa Bay and the Sun Coast Section of APA Florida. Thank you to The Beck Group and Jacobs for hosting the lunch programs and sharing your private consulting perspectives, and to all of our contributors for sharing your hospitality and valuable insights: Tampa Downtown Partnership; Walk Wise Tampa Bay; City of Tampa Parks and Recreation; Tampa International Airport; HART; TECOline Streetcar; University of South Florida; the Center for Urban Transportation Research; USF’s Masters in Urban & Regional Planning program; FDOT District 7; Ybor City Development Corporation; and Port Tampa Bay. We are looking forward to FLiP 2017!